Print Book 350 pages in 1 volume (printed book) with downloadable forms Note: For print books, with MCLE's supplementation service, new supplements and revisions are mailed automatically with an invoice. If you do not want to subscribe, please check the opt out option during checkout. This handy primer is a step-by-step guide to developing a trademark management system. Use it to expand your knowledge of the various types of marks and their relative registerability; how to perform a trademark search and clearance; how to apply for and register a trademark; proper use and maintenance of trademarks and the methods for enforcing those trademarks. Sample forms round out this practice tool—use them as you develop your own trademark management system. See Chapter 2 for two new checklists. The first provides an aid in determining the nature of a client's need for intellectual property legal services; the second provides details to consider relative to information-gathering at the client intake stage of representation. See Chapter 3 for a checklist for examining a proposed trademark. This tool helps to ensure that counsel reviews a client's idea carefully prior to taking action. 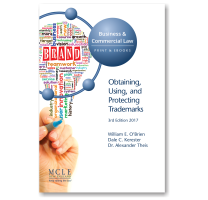 Chapter 3 also features a checklist of considerations for ex parte trademark cases. See Chapter 4 for a good example of a simple cease-and-desist letter. Chapter 5 provides a checklist of elements that are essential considerations in the drafting of such letters. See Chapter 8 for a brief discussion of the European Union's treatment of trademarks that cannot be graphically reproduced. We at MCLE trust that you may find this material useful in your trademark practice, and valuable in maintaining your law library.